Harry Pines lives in Hawaii in “a better lifestyle than you’d expect from a squared-up ex-con.” He manages a beachfront apartment setup that he owns in partnership with his friend Muhammad Ali, a Chicago restaurateur. Harry is a man of many dangerous skills — he was an Army Ranger — and has a hard case toughness that he used in prison to fight and kill for his safety. He knows he has bounced back through dumb good luck and good friends and he’s always ready to pay back for that good fortune. So when Muhammad asks him to come to Chicago to resolve the odd case of a woman found strangled dead in her bed behind doors and windows deadbolted from within, and an unconscious bleeding man atop her, Harry can’t say no. Not to Muhammad who believes in the innocence of the man in the bed. Harry finds himself in jail before the case breaks, and under deadly assault from a pair of professional killers. 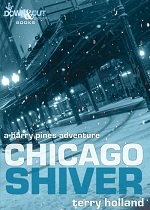 Chicago Shiver ultimately takes Harry Pines to the pinnacle of Chicago political power. And there he finds the truth.